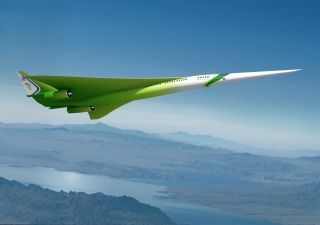 The dream of a supersonic passenger airplane lives on. NASA is currently researching new designs for supersonic aircraft, and the space agency is now focusing on reducing the strength of the sonic booms, the bane of supersonic flight. For a long time, scientists have known that sonic booms — the sound created by a shock wave from an aircraft that moves faster than the speed of sound — are affected by many factors, including the shape of the aircraft and where the plane's components are located. Because of this, engineers are able to change the signature of a boom by design to minimize its loudness during flight, NASA officials said in a statement. This rendering shows The Boeing Company's future supersonic advanced concept featuring two engines above the fuselage. "Engine installation is a critical part of achieving an overall low boom design," Peter Coen, manager of NASA's High Speed Project, said in a statement. "If we mount the engines in a conventional manner, we need to carefully tailor the shape of the wing to diffuse the shock waves. If we mount the engines above the wing, the shock wave can be directed upward and not affect the ground signature. However, such installations may have performance penalties." Inside Glenn's 8- by 6-Foot Supersonic Wind Tunnel, technician Dan Pitts inspects Boeing's 1.79% scale model, which shows the two installed flow-through nacelles. All of the new designs for a supersonic airplane — one each by Boeing and Lockheed Martin — have some basic features in common: either swept-back or delta wings, a pointy nose, and an extremely aerodynamic fuselage. Inside NASA Ames' 9- by 7-Foot Supersonic Wind Tunnel, researcher Don Durston inspects the mounting hardware for the 16-inch scale model of the Boeing concept. What sets each design apart are the other parts of the aircraft and how the components are arranged. Boeing's design has two engines mounted beneath a delta wing, with a third engine on top of the aircraft. The Lockheed Martin design has swept-back wings, with two engines on top of each wing (an unusual configuration). NASA is testing the designs by placing small-scale models of the proposed aircraft in wind tunnels. They are also testing models of the engines by themselves, studying how air flows through and around them. "Capturing this flow rate is important because it directly impacts a supersonic aircraft's thrust performance in flight, as well as cruise efficiency," Coen said. The research is being overseen by NASA's High Speed Project, a part of the agency's Aeronautics Research Mission Directorate. Follow Raphael Rosen @raphaelrosen22. Follow us @Spacedotcom, Facebook and Google+. Original article on Space.com.